I love cookies. I love baking them and eating them and sharing them. I especially love sharing them. Because even though I could down a seriously impressive number of cookies in one go, I love the warm fuzzies I get when I can make someone’s day by giving her a homemade cookie. It’s a wonderful feeling. So last night, I whipped up a batch and a half of these Molasses Cookies from Hell Yeah It’s Vegan. One batch of cookies is usually enough to share between my parents and I, but I had something special in mind for these babies and needed to make extras. 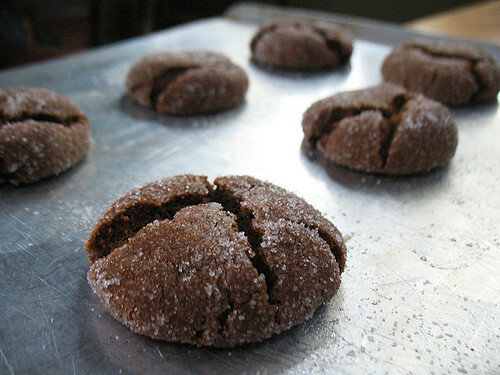 I just couldn’t resist this recipe; I’m a huge fan of molasses cookies, and I was salivating just looking at the pictures of these beautiful little buggers. They seemed like the perfect cookie for a chilly night. Because I’m not a huge fan of it, I omitted the crystallized ginger. I did include the ground ginger, though, because I don’t really mind it when it’s not in chunks. The dough came together wonderfully, and my sampling of said dough reassured me that the finished products were going to be fantastic. I’m not ashamed to admit that I probably “sampled” at least two cookies’ worth of dough while it was chillin’ in the fridge. It was that good. But the finished cookies were even better. See? They’re perfectly chewy on the inside and the tiniest bit crunchy on the outside, thanks to their roll in a bowl full o’ sugar. I just couldn’t get enough of them. The spice blend provides a wonderful little kick, which is complemented by the rich molasses flavor. I used a mix of blackstrap and regular molasses, which I think worked really well. These are the ultimate “cozy” cookie. I predict I’ll be making them fairly often come winter, perhaps even for Christmas. Yum. I did have to restrain myself from really chowing down, however, because I needed to save ten of these lovelies for a special purpose. They’ve left the nest and are on a one-way trip halfway across the country to my boyfriend, because I’m feeling a little maternal at the moment and I want to feed him lots of yummy baked goods, especially ones that make you feel all cozy inside when you eat them. I’m a cookie lover too, and these dark, sugary little gems look perfect! Your cookies look so yummy. I can just imagine biting into a little cloud of molasses. Mmm! Glad you liked them, Vegga!